The sampler kit includes our best-selling save the date magnet designs (classic and grande size), a printed envelope, color chart, and font chart. 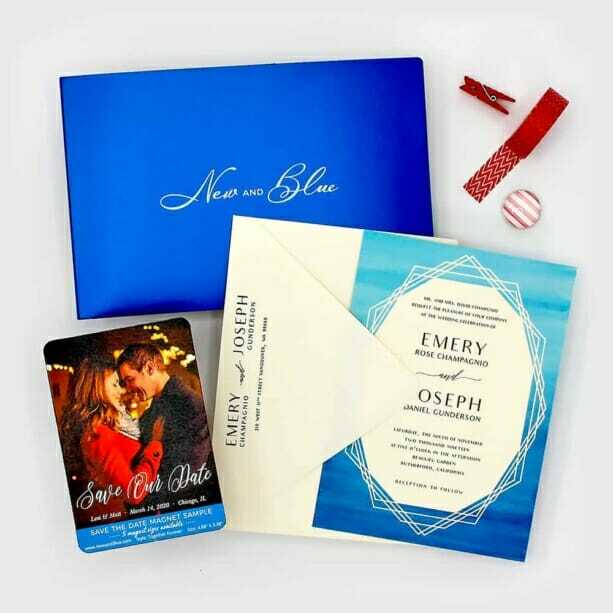 A wedding invitation, save the date card, and all-inclusive invitation are also included. Styles in the sampler kit cannot be customized. Free shipping in the USA. Please allow 2 business days for your sample to be processed. Your kit will then be shipped via first class mail, which typically takes 3-5 business days for domestic (USA) orders. Samples shipped outside the US may take up to 3 weeks for delivery. Please allow extra time for shipping during the holiday season.